29 too glad to do that. After I came home I helped Jennie iron, and in the afternoon I knit some. Ettie spent the day out home when Will took her down town in the evening I went too. And we brought Laura home with us. I knit all the evening. I finished a pair of wristlets I was making for Will. 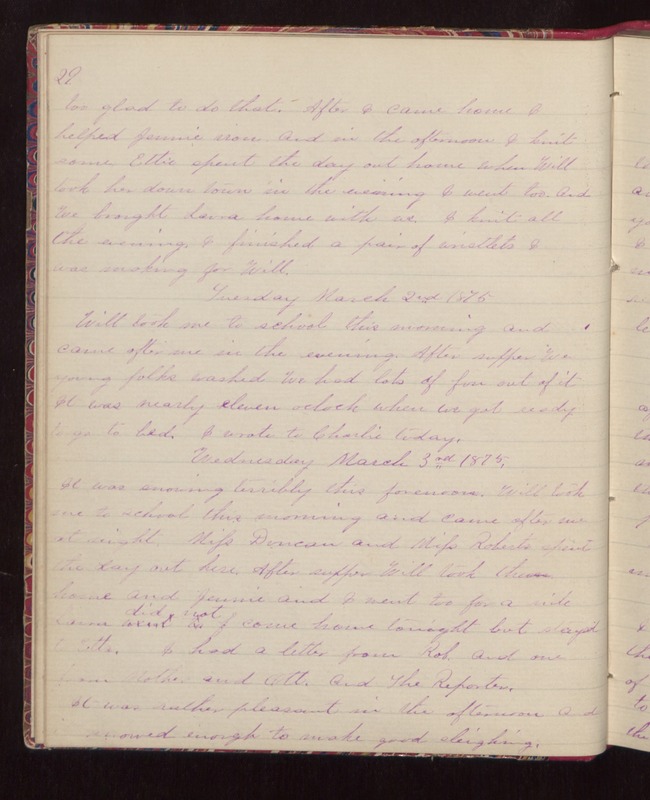 Tuesday March 2nd 1875 Will took me to school this morning and came after me in the evening. After supper we young folks washed. We had lots of fun out of it. It was nearly eleven oclock when we got ready to go to bed. I wrote to Charlie today. Wednesday March 3rd 1875. It was snowing terribly this forenoon. Will took them home and Jennie and I went too for a ride. Laura did not come home tonight but stayed to Etts. I had a letter from Rob, and one from Mother and Ott. And the Reporter. It was rather pleasant in the afternoon and snowed enough to make good sleighing.